Background: League of Women Voters (LWV) is a nonpartisan political organization founded in 1920 to improve our government and engage all citizens in the decisions that impact their lives. Their purpose is to expand participation and strengthen the voice of Americans in all levels of the government by engaging in both educational efforts and advocacy. 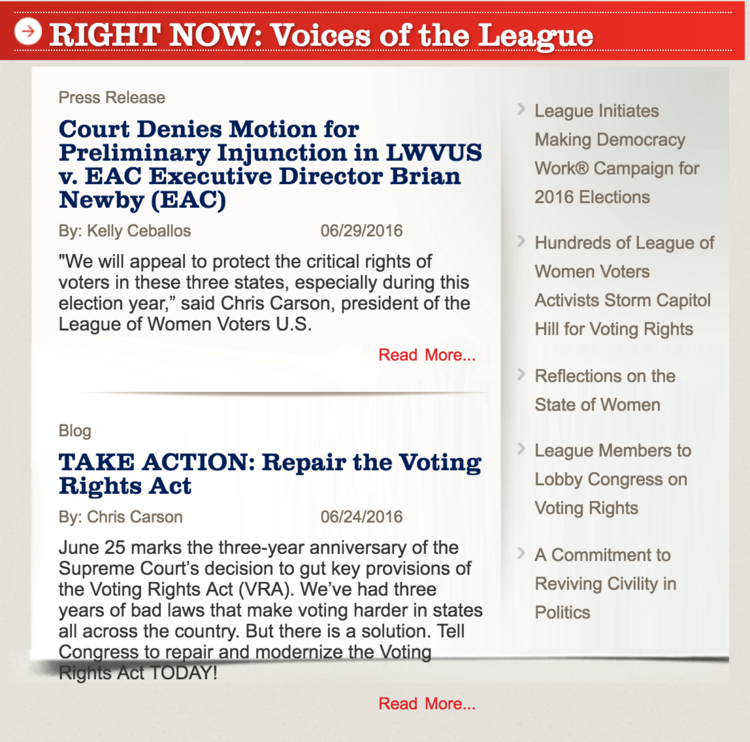 The League of Women Voters has seen poor engagement in its digital media these recent years and wants to create a digital platform that allows constituents to express interest or support for causes so that interested supporters and LWV can track interest on topics. We were tasked with creating a digital solution to attract attention to its preferred causes and to catalyze positive action related to these causes. How can we create a digital solution that is more engaging for constituents and uses storytelling to illustrate the impact of policies on constituents? 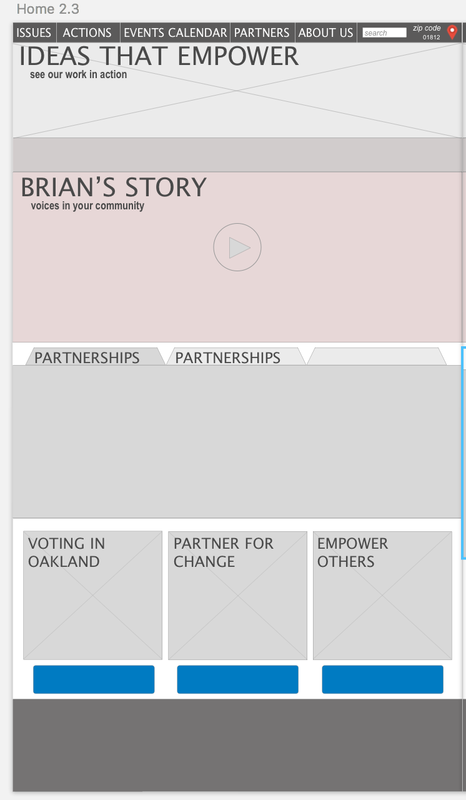 To redesign the League of Women Voters’ digital platform to increase engagement and inspire users to connect with their objectives, mission, and core values as well as to share their own stories. I partnered with one of the team members in a "divide and conquer" approach where we each conducted several interviews with different prospective users and came back together to share insights and translate them into features that addressed their motivations of engagement. The struggles of financially supporting oneself and/or family is more important than getting involved in civic matters. People are unlikely to get involved in an organization if they cannot relate to their causes. Genuine and thought-provoking stories of hardships can encourage people to take action. Stereotypes of who are "underserved" can be a barrier to creating engagement. 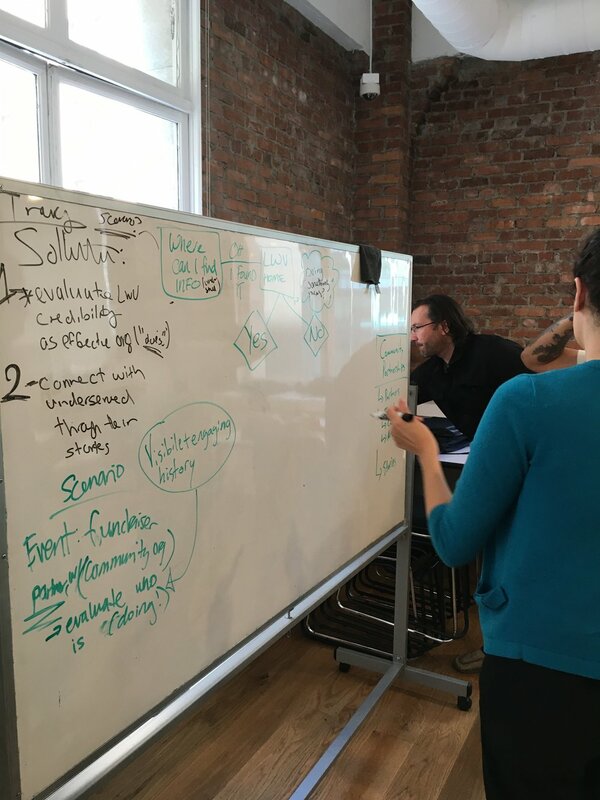 Along with doing user interviews, we did competitive analysis and heuristic evaluations of the website to help us figure out what were some key pain points. "the color schematic is off-putting, a bit too patriotic...doesn't make me feel included as a Latina..." -Amanda R.
"the Donate button is a bit distracting, makes me feel like I have to spend money before I even know why or for what purpose..." -Angela H.
"...too much text, do not know where to start.." -Janet C. "...I want to see images, people like you and me..." -Sharen L.
By distilling the information we obtained from our research, we now know it is crucial to create a mid-fidelity prototype with images and compelling content that relates to the users. By doing so, we can pique the users' interests more and lead to more engagement on the website. Our next step was to create user personas to help us build empathy and focus on designing around the user needs. Our primary persona, the advocate, who will act as the bridge between LWV and the constituents, and our secondary persona, the underserved, who represents a good majority of constituents. I analyzed and synthesized the data with the team to create a user flow. 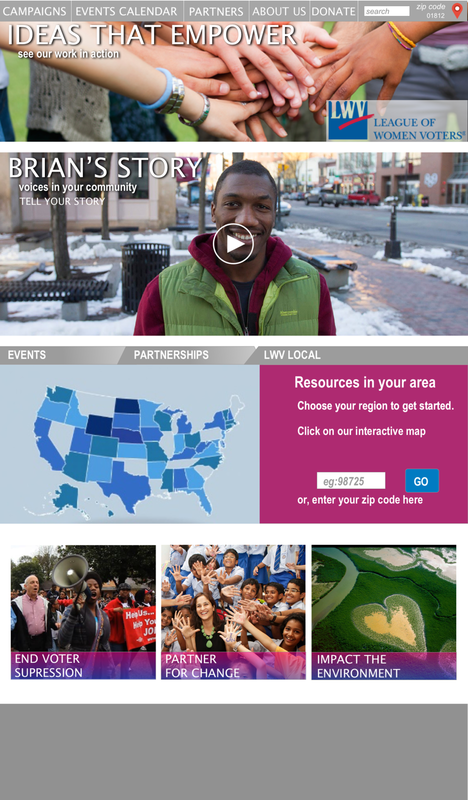 Our hypothesis was then created based on that journey: the advocates will interact with strong visual homepage heroes that speak to current activities and initiatives, and click down into relevant personal stories of those who effectively collaborated with LWV, or used the organization to affect change. We worked in a design studio, cranking out sketches of wireframes. 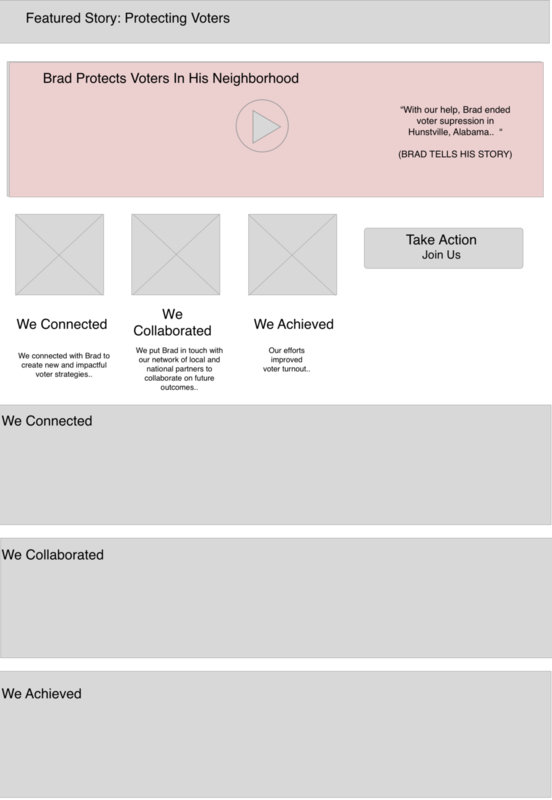 As ideas began to solidify, we collaboratively created high fidelity wireframes and turned them into interactive prototype, and ultimately, the redesign of the website. At each level of iteration, we had the opportunity to validate our design decisions through user testings. From these iterative prototyping, we were able to learn what was working or not, discover new ideas, and catch any technical issues early on in the process. For instance, one of the major problems we encountered was that the user did not want to go directly to the contact page to ask a LWV personnel for a collaboration, but rather find more information about the events hosted by LWV. 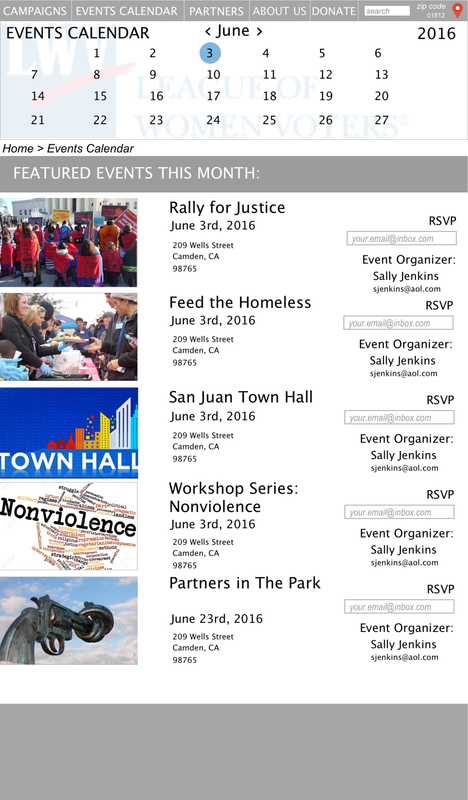 Then they can decide to RSVP and attend those events to see what LWV are providing and doing for their constituents. As a result, we iterated to include an event calendar, a more detailed events page, and RSVP page for the users, which worked really well in the end after another round of user testings. 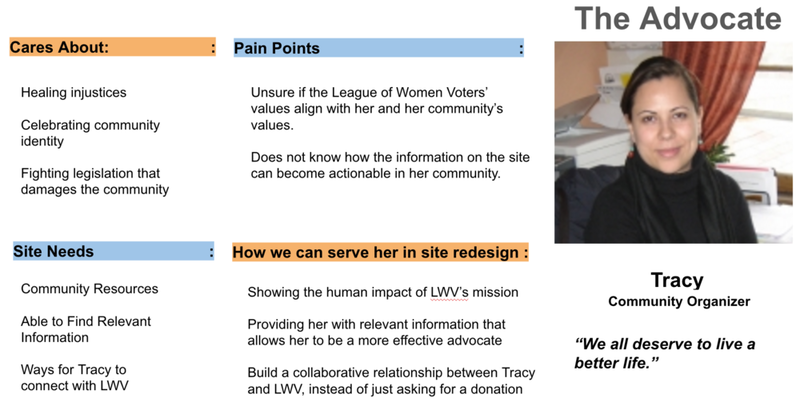 We provided Tracy, our main persona, with a homepage that directs her to visual representation of organizational information, stories of program successes, and filtered contacts to encourage better collaboration, which helped her develop a relationship with LWV and learn about their core mission and values. In addition, we developed an aesthetic that welcomes a larger foundation of prospective users and speaks to the future of voting in the United States. To work on a case involving politics was a bit tricky. Our team had to address the discomfort presented by the varying social levels of the group members. However, this kind of creative tension allowed us to refine our design decisions from the very beginning and helped set the foundation of making a good design that helped solve the problem. Also, one of the most important thing I've learned throughout this project was that it is very important to decide on what contents to have in the design to show the messages you want to convey to your audience. In this case, the contents were strong visual images and compelling user stories that allowed users to be more engaged and wanted to find out more about the contents. For the next steps, I want to interview a larger variety of users and have them test out the new design. 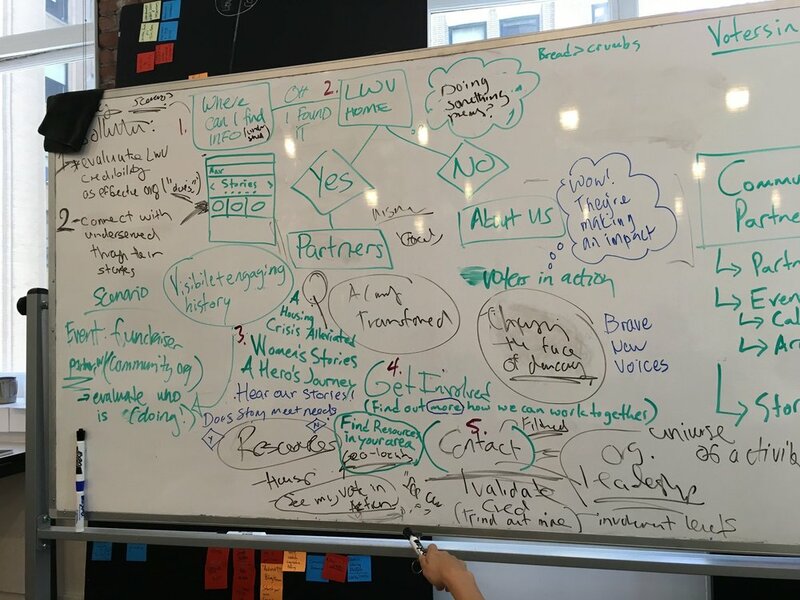 Another plan of action is to have the League of Women Voters harvest stories that emerged from their events by using an API that collects media using a hashtag promoted at their event. From that, they can see a raw number of stories collected and have them recycled into their website. If these stories work, then there could probably be an increase in event attendance and more stories could be collected. Lastly, I would like to integrate these stories in social media to be shared and hopefully bring more awareness.